So, I am into day four of the Picture Book Challenge with Paula Yoo (seven books in seven days) and this one is sort a light-hearted picture book about ice cream and an alien invasion. I tried to keep the language peppy and fun, and given the warm weather where I live, about ice cream. Am I the King of Similes? I spend the month of April writing poems each day over at Bud Hunt’s blog. There were some cool ones and some throw-aways. That’s writing under pressure for you. 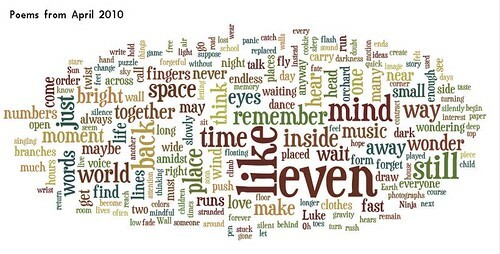 I gathered up the 30 poems and dumped them into Wordle, just to see if there any emerging themes from what I was writing. Here’s what I noticed: I used the word “like” a lot. Like, too much. Like, I must be overusing similes in my poems. And I think when I do write poems, I do use similes and metaphors a bit too much, because I am trying to move the poem from something concrete to something abstract, and that’s difficult to do without those comparisons. I don’t intend to abandon the use of these literary devices, but I like how the Wordle made that visible. Also, it’s neat that “music” and “mind” were part of a lot of the poems. I’m not sure what to make of the word “even” as the most prevalent word in the batch of poems. It doesn’t seem to have much meaning for me. for the flowers to bloom. often ends as a monologue of one. This is the third picture book I have made this week as part of a challenge with Paula Yoo and I was thinking of this girl under the bridge and imagined that she was dreaming of her future. The word “remember” came to mind, although it is not clear if she is looking ahead or looking back. I purposely kept that somewhat nebulous, although the last page gives some hints. I’m in day two of the National Picture Book Writing Week (NaPiBoWriWee — that’s a mouthful, eh?) with Paula Yoo, and again, I turn to Storybird for the art and inspiration. In this book, I imagine a storyteller (a piece of bread!) telling the tale of a young boy learning about anger. The story emerged from looking at the picture on the cover here. I wondered: what would a face in your stomach say to you? And what would the kid think? From there came The Boy with the Angry Stomach. I realized that I needed to wait until the kind folks at Storybird moderated my picture book story until I could get the embed code for it. This is part of the Picture Book Challenge. This book is called MoonSong. Not another challenge. Yes, another challenge. 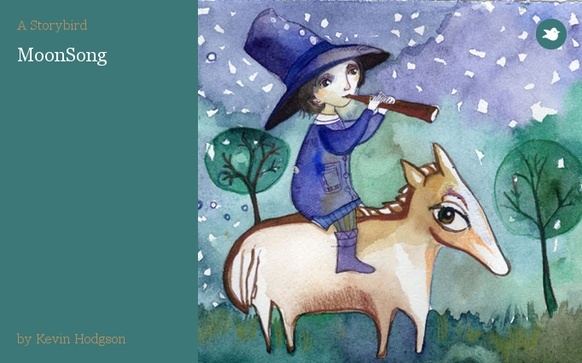 This one is National Picture Book Writing Week, in which blogger Paula Yoo is challenging folks to create seven picture books in seven days. That seems like a lot, and if I were to draw, it would be impossible. But I am a writer and I do love a challenge, so I am going to use Storybird to see how many books I can create this week. Here is Day One. The book is called MoonSong, and I was thinking of how to weave music into a picture book story. I wondered: what if the moon were inspiration but didn’t know it. (I am having trouble finding the embed code, so here is the link to the book at the Storybird site). I recently picked up Building Literacy Connections with Graphic Novels: Page by Page, Panel by Panel, mostly because it is edited by James Bucky Carter, whose writing and links and insights around comics and graphic novels I enjoy reading about. (Check out his blog: EN/SANE World). In this collection of essays from various educators, Carter weaves together ways in which teachers can bring graphic novels and comics into the curriculum. Carter’s introduction gives some nice background knowledge around the connections between art and writing, and the form of graphic novels. In the book, Carter makes the case for these forms to be considered real and authentic forms of literacy, and not just something to be laughed off or put out for the down-times of the classroom. Not every chapter had me engaged, but the one I really liked was by Don Leibold, whose Abandon Every Fear, Ye That Enter: The X-Men Journey through Dante’s Inferno, about the connections between an X-Men story arc and Dante’s work, and how a teacher might use on to supplement the other. I vaguely seem to remember the comic that Liebold refers to, and it is fascinating to think of the two stories, side by side. Most of the chapters deal with reading comics and graphic novels, and I have to say that the chapter that seemed to suggest the use of technology (Using Graphic Novels, Anime and the Internet in an Urban Setting by Nancy Frey and Douglas Fisher) didn’t really do much for me in terms of technology and comics. I was hoping and wishing for more, particularly given the influx of digital comics and the ability to create them easier than ever before. Luckily, Carter ends the anthology with a sharp chapter on bringing young writers along with comics as a source of mentor text and inspiration with a Comic Book Show ‘N Tell Project in which students work on storyboarding, editing and writing with a voice for an audience. If you are a teacher considering the merits of graphic novels, then Carter’s anthology collection is a good read and a good starting point for those folks trying to make a case for comics. And as Carter points out himself, I hope books like this one continue the push of graphic literacy in the classroom for all students. PS — Today is Free Comic Book Day, so get yourself down to the nearest comic book shop and grab some comics for the classroom. The free stuff is not really the best stuff — mostly samples and anthologies — but still, they can make a good supplementary classroom resource.